Usual morning routine for me and the pain is not getting any better. I think we had bacon sandwiches for breakfast as it was Nicole's birthday but I could be wrong, I know we did one morning. I had a much longer walk as the others got ready for our day out, I say much longer but it was still only relatively a short walk. 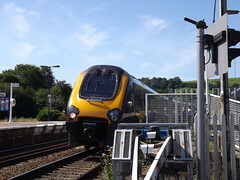 I did the same walk as yesterday then continued over the level crossing and part of the way up the hill on the opposite side of the track (not the wrong side of the track). I found another pub up there that I had not realised was there. 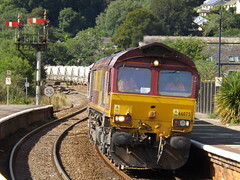 I also sat on the station platform, watched two or three trains pass through and took several photos. 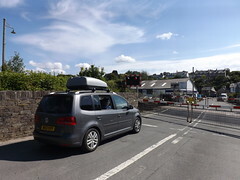 We had to go out over the level crossing to get to Polperro and just our luck the crossing gates came down just as we got there. I got out of the car to take some more train photos. On arrival at Polperro, we parked up in the large car park on the outskirts of the village and set off down this hill towards the harbour. Everyone has to do this but there are little electric buses you can take if you want (for a small charge). 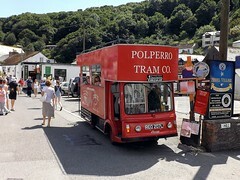 Most of Polperro was just how I remembered it, well most of it was. You know how yesterday I said I had never been to Mevagissey before, well I must have been, because lots of things I though existed in Polperro where not there and were actually in Mevagissey. 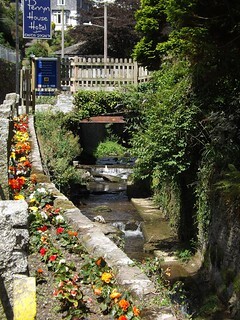 It would seem that besides the walk down to the harbour, all my memories of Polperro were actualy of Mevagissey. Around 1980 we must have visited both places in one day and I had just got it all muddled together in my head. 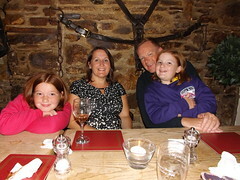 I have checked the photo evidence from our trips to Devon around that time and we only did one venture into Cornwall. Strange how time plays trick with your memory. 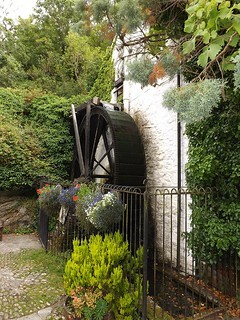 The waterwheel at the top near the car park and the walk down were just how I remembered Polperro though. 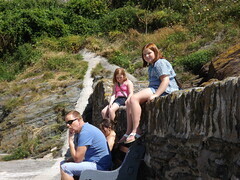 We walked round both sides of the harbour (much smaller than Mevagissey) and even climbed on the rocks, where the boat trips leave. 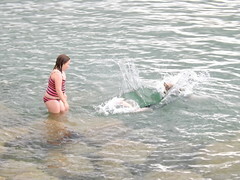 As yesterday the twins were itching to get into the sea but also as yesterday we had plans to do that later in the afternoon. It was great to just sit in the sun for a change this year. 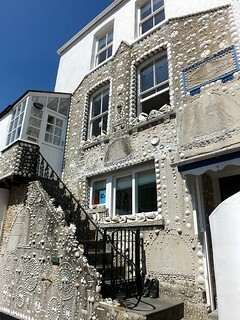 Dot wanted to find the shell house that she remembered from our visit years ago, a house decorated with sea shells but when we found it it wasn't as impressive as we remembered. On the way back out of the village while shopping and exploring, we came across a small cafe with a seating area out in the sun and stopped for a drink and a pasty. We were rewarded with the most miserable waitress I have had the displeasure to meet in a very long time. The pasties were nice but the service wasn't and most of the others eating there were visitors from our European neighbours, she was not setting a very good example. As we headed back up the hill towards the car park the girls got ice creams and then decided they would take the bus ride. 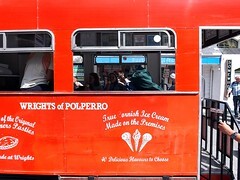 The man operating the bus said it was ok to take their ice creams on board so Dot, Georgia and Emily went that way. Nicole, Tim and me walked back. 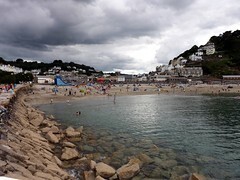 Next we drove to Looe, another place that looked completely different to my memory. 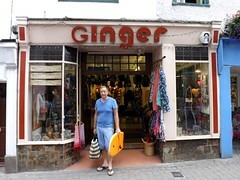 I wonder where the place is that I always remembered as Looe. 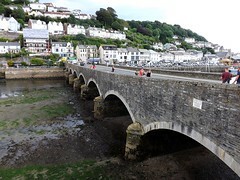 We could not get parked in the centre of town so headed back out and parked in the large car park by the West Looe River, near the confluence with the East Looe River. 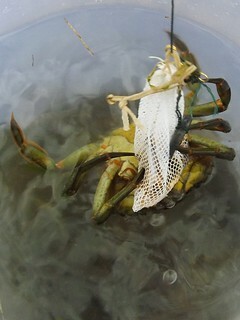 The girls wanted to go crabbing and had all the gear required with them, including bate, but the tide was out, although some were grabbing in the pool there. 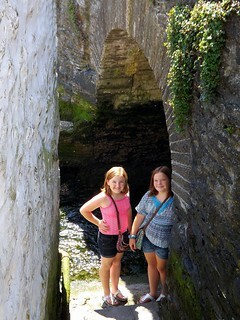 We walk walked along the river were we could then crossed the bridge into town and passed all the shops to the beach. We got some money from a bank and I got a cup of tea from a small cafe. Dot and I, sat on the end of the short pier where we could see the girls playing in the water and it was nice and warm, shaded from the cool breeze. But we had to move when a couple of groups of teenagers assembled at the end. Why do youngsters have to shout everything, they do not seem to know how to talk or read come to it. As they started jumping of the pier, right next to he sign forbidding jumping off the pier. 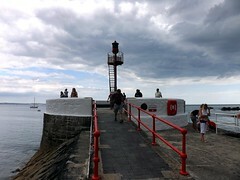 Also amongst the shouting every other word was a swear word, showing their total disregard for others, mainly other families walking the pier. 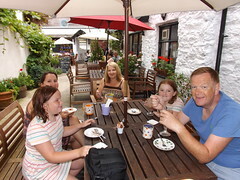 After the messing in the sea we had a quick look into the shops then sat outside a cafe, the Court Yard, for a warm drink and some cake. Very different from the last place, here they were very friendly. 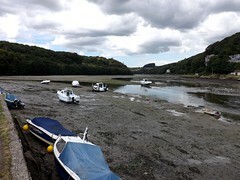 So now it was time to go crabbing, there were a few people trying to get crabs from the river in town but we made our way back to the West Looe River closer to the car, where we knew there where grabs. 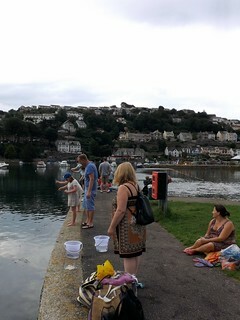 The tide was well in by the time we got there and plenty of people were catching plenty of crabs. Once we got the hang of it we caught plenty too. 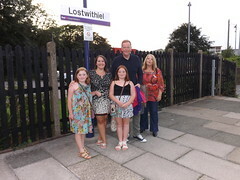 When it got too cold (for the grown ups) we packed up set the crabs free and headed back for Nicole's birthday meal. Nicole had picked out an Italian restaurant for her birthday meal but when she phoned to book it was already fully booked. We had read good reviews for the pub I had found on the morning in the accommodation visitors book, so I got dropped off there as we passed, to check it out while the others got ready. I had a beer and took a photo of the menu with my phone, I also booked a table provisionally for 20:30 and set off back to the others. After deciding we would go to Earl Of Chatham (the pub), I rang to confirm and we set off to walk in plenty of time to be early. 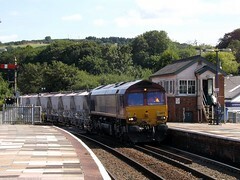 Unfortunately the level crossing caught us out again, so I rang again to say we would be late. We had very good food and service, plus I had a couple of new beers. 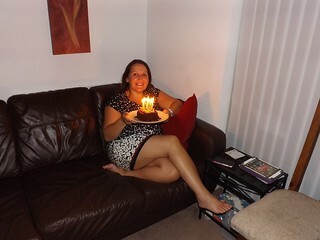 Later back at the room, We had chocolate cake for Nicole's birthday.